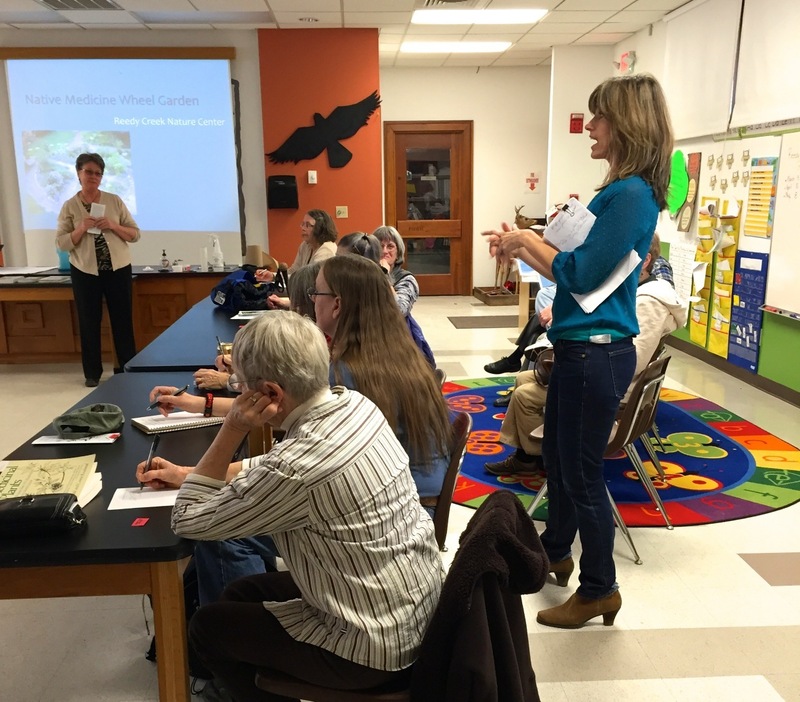 The Southern Piedmont Chapter had another great turnout for our February meeting at Reedy Creek Nature Preserve. The native plant Medicine Wheel Garden at Reedy Creek will be an ongoing project for our chapter, as we work together with staff at the preserve to create what we hope will be a beautiful and educational public space. The meeting was an opportunity to learn more about the medicine wheel concept and to find out ways to help get the garden underway. We gave away plants and other doodads as door prizes, which made for a fun end to the business part of the meeting. Christy let us know to listen for NCNPS ads on public radio soon. As much as 50% of NPR listeners are gardeners, she told us. Good way to get the word out about native plants, Christy! The garden is divided into four quadrants, with each representing a point on the compass  north, south, east and west. Each quadrant will have plants of colors typically associated with these points by Native Americans. All the plants will have been used as medicine by Native Americans, and all the plants will be native to Mecklenburg and adjacent counties. in February! The lovely weather made it hard to think about waiting weeks to plant, but a planting day is scheduled for late March.